√ No equipment? No problem! √ New to exercise? You're at the right place! √ Access daily, custom workouts at our class or through our app! Two Healthy Lifestyle Solutions for Anyone, Anywhere! Since 2012, Workout Anywhere® has been helping busy parents live healthier lifestyles anywhere! Whether at home, the gym or on-the-go, one can access the best quick and effective daily workouts right from our mobile app Workout Anywhere® (with minimal to no equipment needs)! Founded by Spokane, WA natives Jessica and Justin Rundle, Workout Anywhere® is the ultimate training app for living a sustainable, healthy lifestyle. Granted, our app forgoes much of the hype and fitness fads that’ve saturated the fitness industry, because, we believe hype doesn’t equal results. If you’re looking for a no nonsense, highly effective, quick, smart and supportive training program for your busy lifestyle, Workout Anywhere is for you! RundleFit is the local, Spokane, WA and Pacific Northwest based group training solution for busy parents, employees and athletes seeking the ultimate edge in their physical fitness and performance. 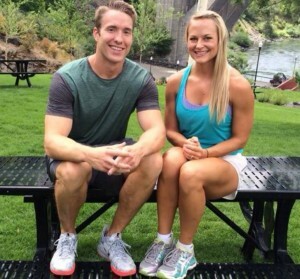 Coach Jessica and Justin Rundle know most fitness and sports related goals personally, and are both educated, certified and have been successful with most client goals long before many of their competitors were even in existence. If you’re looking for training from two of the area’s leading experts, who’ve founded a training style that simply works; and will have your friends, peers and coaches in awe, then RundleFit is definitely for you! For further class times, daily lessons and app details, Join The Team! We would love to help you live a healthier lifestyle, starting today! Boom Baby!!! Thanks to Workout Anywhere coaches Jessica and Justin Rundle, I'm almost back to high school wrestling shape! I've been a part of RundleFit's boot camp and Workout Anywhere Team for four years! So has my son and husband! Their program has taken me from a beginner to advanced fitness level and I absolutely love training with the Rundles!! Being a busy mom and attorney makes life hectic! Thanks to Coach Jessica and Justin, I've finally lost the baby weight and I feel GREAT!